Over the years here at The Source Page, one of the most asked questions has always been "How did the GTA come into existence?" Granted, there was some degree of broad knowledge of the origins that could be gleaned from publications of the era, but nothing really concrete..... either in first-hand experience or inspiration. I tried everything imaginable to try and gain some deeper insight into the beginning of our cars: scanned old magazine articles.... scanned new magazine articles.... reviewed websites, everything. Of course most of the people who had or have knowledge about the GTAs have long since moved on to other positions within GM, with other companies, or entered the golden days of their retirement. So, what's a fellow to do...? Well, my friends.... sometimes you just plain get lucky and the sun shines on you. "Back then, our Firebird carline was falling well below its historical share of the 'Pony Car' segment. I remember being in my office one Saturday morning with all the historical sales data, product information, market research data, and magazine reviews that I could dig out of our files. In short, all this information told us at PMD that Mustang and Camaro both had solid images in the market, whereas the Firebird image was quite convoluted overall.... and still had two noticeable gaps." 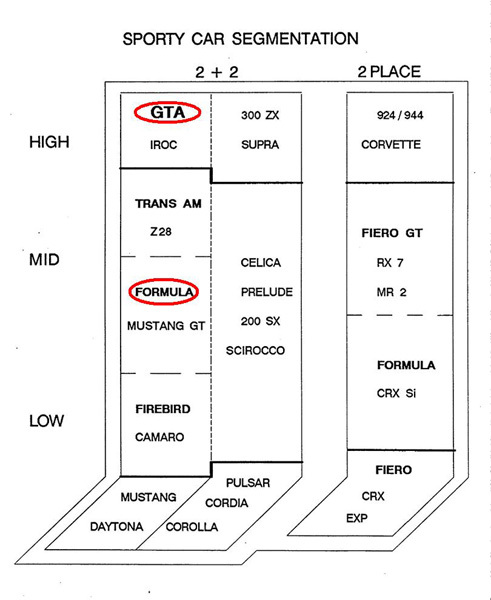 "One gap was at the mid-level segment where the Mustang GT was positioned. There was an opportunity there for an F-body, but neither Pontiac nor Chevy were addressing it in 1985. In those days. Chevy preferred to stay at the high end with their flagship Z28 and we were both doing well on the low end with the base Camaro and Firebird. It was decided that Pontiac's response to that opportunity should be to drop the Firebird SE and reintroduce the Firebird Formula.... to me, that was no-brainer. Addressing the second gap in the high end took a bit more thought. A big chunk of the Trans Ams we sold back then were fully loaded to a more upscale buyer than the Z28, and those customers were telling us that their vehicles weren't quite as 'refined' as they'd like them in a high end 2+2.... neither in appearance nor ride. I've included a sporty car segmentation chart that I developed back then. I think it will enhance understanding of just what we were trying to do with the Formula and GTA." "I had recently visited Wright-Patterson Air Force Base in Dayton and was quite impressed with the appearance of the SR-71 Blackbird spy plane. I only knew the SR-71 by its reputation: it was the meanest, baddest, and fastest military aircraft of its day. Just sitting in the hanger, it's long sleek lines and black monochromatic paint scheme gave me chills. I can still remember being absolutely overwhelmed in its presence. I thought: If the USAF could have its Blackbird, why shouldn't Pontiac ?" "A short time later, we contacted the Van Nuys assembly plant and had them build us a fully loaded black Trans Am. When we had the car built at Van Nuys, there were certain things we could leave off (decals, stripes, accent paint), but not the fender extractors (it's hidden by my left leg).... remember, this was back when a GM car division could still do those kinds of things when you had friends at the plant. When the car arrived a week or so later, I had it put into service as my company car, and drove it around Detroit. I got all kinds of 'thumbs ups' and people wanting to know what kind of car it was, where they could buy one that looked like that, etc. By the reaction on the street, I knew we were onto something." "We showed the car to a noted designer at GM Design Staff, and he loved it. He thought we should get as much differentiation from the standard Trans Am and he suggested we eliminate the side fender extractors, add the export 'paddle' outside rearview mirrors, and some cloisonné emblems. I remember his exact words, "only jewelry for this car....". This particular designer was of Italian heritage and instead of 'Blackbird'.... he wanted to call it 'GTA' for Gran Turismo Americano'." Lou told me of a three-hour "tire-kicking" session at GM Design Staff with the black car shown above and also a red car that was used to test differing appearance schemes for the GTA. Two cars were used, but four schemes could be contemplated by "clown-suiting" the cars. According to Lou, the cars were done up with a different appearance scheme on each side of the car. Different looks could then be laid out in mere minutes by the stylists, and the two different colored cars gave stylists freedoms to examine how the cars' color affected the overall harmony of the various exterior design schemes. Several schemes were looked at closely before it was decided to make the car monochromatic with the cloisonné emblems. Lou continued: "Eventually, the car was retrofitted with all the content that was finally released for 1987. Though all the parts to create a GTA were already in the plant (except the cloisonné emblems), unfortunately for Pontiac we could not get the car on the road until the 1987 model year. Remember, that was back in the CPC days, when the paperwork to make even the simplest of changes took forever...."
Interestingly enough, he also said that there was also a GM photographer in attendance who was recording the entire episode on film. Lou said that he had no idea what might have happened to all the images captured that day, but wouldn't that be a treasure trove if they could be uncovered? It would make a great "Department X" article for High Performance Pontiac magazine, don't you think? I know, I know.... we've said for years that there was no known GTA prototype, but in fact, there absolutely was. I've always wondered, but never had anyone's proof until now. Lou told me he didn't know what happened to the car after he left Pontiac.... it was still an "87 GTA" when he left. He told me it was most likely either destroyed or retrofitted back to its original 1985 equipment and possibly disposed of at a GM auction. I guess it would be hard to sell a used '87 GTA that had a 1985 Trans Am VIN.... wouldn't the DMV folks have some fun with that one? "The OSRV paddle mirrors were actually used for all F-car exports. They had 'slightly' blue tinted glass and were of the break-away variety. As I mentioned, many designers really liked them because they appeared to stay so far outboard of the door/greenhouse, unlike the standard aero mirrors. I loved them because they gave the car a really unique head-on appearance. Being export mirrors, however, the vendor just wasn't geared up to supply enough quantity for the GTA. We had all sorts of fit and color match problems, too. Finally, someone (not me) made the decision to cancel them. I always lamented that decision...."
· 01/17/1985 – Idea for top-of-the-line Trans Am conceived while viewing USAF SR-71 Blackbird at Wright-Patterson Air Force Base. · 04/03/1985 – ‘Tire-kicking’ session at GM Design Staff Ponderosa where alternative GTA appearance themes were reviewed. · 05/31/1985 – Preliminary Pontiac senior staff approval of GTA appearance and content. Black 1985 Trans Am retrofitted with specific 1987 GTA content. Another GTA project Lou was very familiar with was the ill-fated GTA Notchback project, finally produced for 1988. Taken on by Auto-Fab, Inc. (AFI) of Auburn Hills, MI,.... the project got off to a slow, languishing start. Apparently, AFI built the first two "prototype" decklids and then flew the parts out to the F-Car plant in Van Nuys, CA. Upon arriving and trying to fit the parts to the GTAs on the assembly line, the fit was noticeably off. GM very quickly ordered AFI to produce a second round of parts; the second time was not a charm, either as the second attempt at fitment was no better than the first. While going over some of the plans for the decklid, one of the people from Auto-Fab said offhandedly to some of the GM people in attendance that they didn't understand the fit problems that were in evidence as A-F had built the decklid "to print" (GM spec). At that time, one of the GM brass piped up and said that was most likely the problem.... since the 3rdGen F-cars were "1/2 inch out in the RH rear corner". So any time you look at a 3rdGen F-car and notice that the rear panel overlaps the taillamps just a bit.... now you know why. The fit and alignment problems on the decklid itself were never really satisfactorily solved during the short time the option was available. If you have a Notchback, you know what I'm talking about. There is virtually no way to adjust it and get all the panel gaps in correct alignment. You pretty much have to get it as good as you can and just leave it; luckily for those of us who have these cars, most people are so taken with the design and appearance of the decklid itself that they never seem to notice the shortfalls on panel alignment. Lou said that possibly the main reason the option never took off could very well have been the general malaise within Pontiac for the option itself. He told me that it seemed like the division never really was sure if they wanted to produce the decklids or not.... that no one could seem to come to a consensus on anything regarding the project. For those of you familiar with stories about GM especially from those years, the "red tape" could be (and very often was) almost insurmountable most of the time. So one can easily see where this situation might have come into play without serious support within Pontiac for the Notchback option. In the end, the Notchback was only offered on the GTA for a single model year and in no way could it really be called any type of a success. A myriad of problems.... production woes, safety concerns, cost issues, quality control, and others.... combined to keep one of the most distinctive 3rd Generation F-cars from possibly becoming a sales success. But at least these days, out in public it often still inspires quick and decisive feelings and opinions.... people either like it or they don't. So that pretty well sums up the story of the origins of our fantastic cars, folks. This section will, of course, be updated as new information comes to light on these topics and many thanks to Lou Wassel for sharing his remembrances with me on the beginnings of the GTA.